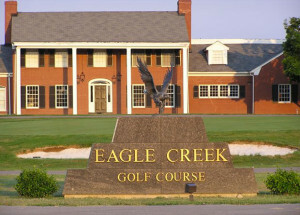 Eagle Creek Golf Course is a beautiful public 18 hole golf course, owned by the City of LaGrange and managed on-site by Guy Breeds. Only 22 miles from Downtown Louisville, we are conveniently located just 1.5 miles south of I-71 on Highway 53. Eagle Creek is open to the public 7 days a week and can provide a challenge to golfers of all skill levels. The course is well maintained and features Bermuda fairways, bent grass greens, and has woods surrounding a number of holes. The serene setting makes it a perfect escape from the hustle and bustle of life to get out and enjoy a good time with family or friends.